World Ovarian Cancer day in May is the day of the teal takeover campaign. For ovarian cancer charities the day is important for raising awareness about the disease. Ovarian cancer is known as a silent killer and is the fifth most common cause of cancer among women in the UK. Over 7,000 cases are diagnosed each year but 80% of women do not know the symptoms. Most women who are diagnosed with ovarian cancer are older than 45 and have been through the menopause. 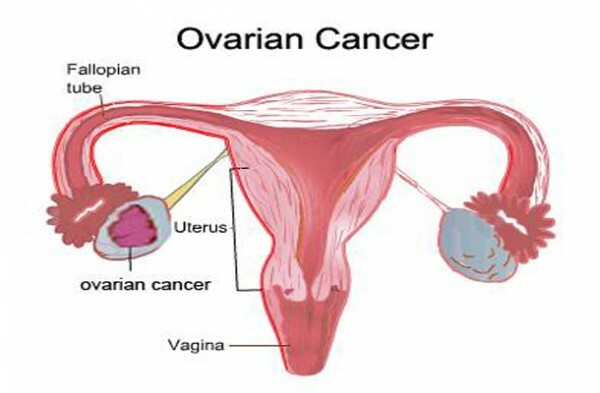 There are different types of ovarian cancer but the most common are epithelial ovarian cancers, which is where the cancer began in the layer covering the ovary. About one in ten ovarian cancers are caused by an inherited faulty gene. If you have very close relatives who have breast cancer or ovarian cancer, you may be at more risk of developing ovarian cancer. One of the reasons that it tends to be diagnosed at a later stage is that symptoms of ovarian cancer are quite vague. Also, many women with very early ovarian cancer don’t have any symptoms at all. See our misdiagnosis page to view all the symptoms of ovarian cancer. Ovarian cancer can be successfully treated when caught early. Knowing what to look out for and what to expect from your GP or doctor is extremely important. It is hoped that by raising awareness of the symptoms and who is at particular risk will mean that those suffering with ovarian cancer will be diagnosed at an earlier stage of the disease, which will in turn increase survival rates. At present, sadly, the UK has the worst survival rate for ovarian cancer in Europe. The statistics speak for themselves: there is a 90% survival rate if ovarian cancer is diagnosed in the early stages compared with a 22% chance when diagnosed in the later stages. At present there is no screening test for ovarian cancer and the traditional diagnostic blood test has been criticised as unreliable. The current blood test measures the amount of CA125 (a protein found in the blood) and uses a fixed cut-off level of 35 to determine whether a patient should be referred for an ultrasound scan. The problem with the current test is that whilst increased levels of CA125 have been linked to ovarian cancer, it is not determinate of the presence of the disease. The level in a person’s blood can rise because of other conditions such as infections and inflammation. Additionally, previous screening has shown that some women with high levels of CA125 were free from ovarian cancer whereas those with low levels did have the disease. The results of a 14 year collaborative study led by University College London have recently been published in the Journal of Clinical Oncology. This study has refined the current diagnostic test and looked at whether annual blood tests could be used as a biomarker for ovarian cancer and as a possible cancer screening tool. The study developed a new procedure called the ‘risk of ovarian cancer algorithm’ (ROCA). The research followed 46,232 participants who had their blood tested once a year to measure their levels of CA125. This was analysed by a computer programme which used a statistical calculation to interpret variations in the level of CA125 and predict the risk of ovarian cancer based on the participant’s age, the original level of CA125 and how this level changed over time. This new test correctly diagnoses 86% of women with invasive epithelial ovarian cancer, whereas the existing test would have been expected to identify fewer than half of these. The results may mean that there is a real possibility of having a screening programme for ovarian cancer in the future.